This is inspired by a recipe in the Moro cookbook, which called for white fish served with a tahini sauce. 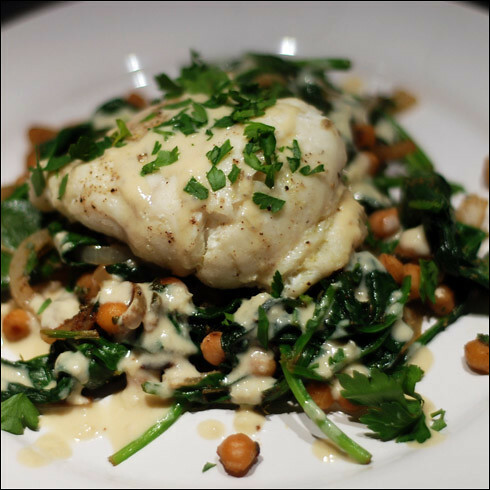 White fish and tahini is a winning combination, and it seemed only right to pair it with something equally Middle Eastern in style - spinach and chickpeas with plenty of cumin and coriander. Upon setting this down on the table, my other half exclaimed that it was something out of the ordinary. The ingredients are faintly exotic, but it is simple enough to set down on the table as a weeknight supper. Begin by pre-heating the oven to 200°C to bake the fish. Then, in a bowl, put the tahini paste, lemon juice, olive oil, a pinch of salt and crush in two of the garlic cloves. Add boiling water and whisk vigorously until it is about the thickness of paint and fully emulsified. Set aside until you're ready to eat. Skin the fish and then place both fillets on a baking tray with the top and bottom tucked underneath. Add a drizzle of olive oil, season with salt and pepper, add a splash of lemon juice then cover with foil. When the oven is up to temperature, bake for 15 minutes. Once the fish is in the oven, rinse and drain the chickpeas if using tinned, thinly slice an onion, and gently fry both in a pan with a little oil and a teaspoon each of cumin and coriander powder. When the onions begin to turn golden, roughly chop and add the parsley, crush in the remaining four garlic cloves, add the spinach, a tablespoon of lemon juice and the second teaspoon of cumin and coriander then cook until the spinach has wilted down. Arrange the spinach on each plate, then place a haddock fillet on the spinach. Drizzle with tahini sauce, garnish with a pinch of parsley and serve immediately. Oh wow wonderful image and food I really like it. Thanks for the posting you are great job for the visitors.